Pumpkin season is in full tilt and we are just getting started. One of my favorite surprise combos years ago was a recipe for chocolate chip pumpkin cookies. Candidly, when I read the recipe, I just didn't feel it. However, that is what experiments are for and oh my, the taste was incredible. This year, I wanted to ante up the same combination with a new twist. 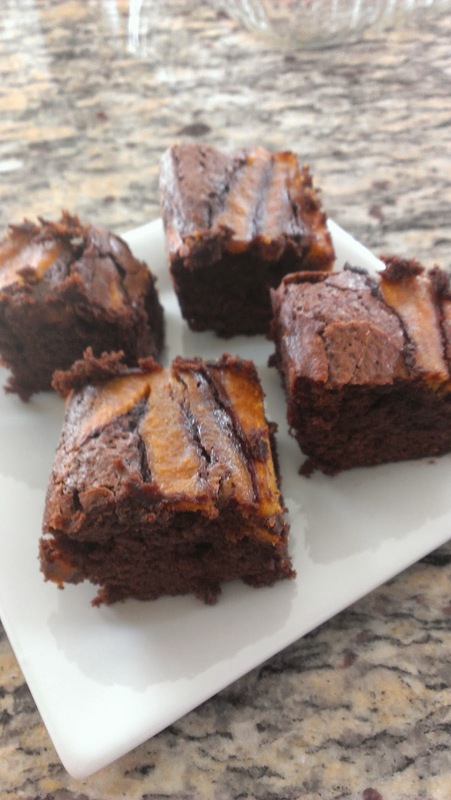 Welcome to the incredible, thick, rich, dense dance of chocolate and pumpkin all marbled up into a brownie. Want some? Me too. From my kitchen to yours, enjoy every bite. 1. Preheat oven to 325 degrees F. Line a 13x9x2-inch baking dish with parchment or foil, extending over the edges of the pan. Spray w/ nonstick spray. 2. In a medium bowl blend greek yogurt OR cream cheese with 1 T butter in your mixer or w/ hand blender for 30 seconds. Add 1/2 cup sugar. Beat until combined. Add 1 egg, the pumpkin, 1 t. vanilla, the ginger and cinnamon until combined. Add 1 T flour. Set aside. 3. In a small bowl stir together the 1 and 1/4 cups flour, baking powder, salt. 4. In a large saucepan combine the chocolate and 3/4 cup butter. Cook and stir over low heat until melted and smooth. Remove from heat. Gradually add the 2 and 1/4 cups sugar beating with an electric mixer on low speed just until combined. Add the 4 eggs one at a time, beating well after each addition. Add milk and 2 t. vanilla. Gradually beat in flour mixture just until combined. 5. Spread chocolate mixture evenly in the prepared pan. Spoon pumpkin base mixture in several mounds on top of the chocolate batter. Using a knife or narrow spatula, gently swirl into chocolate batter. 6. Bake about 60 minutes or until center is just set when pan is gently shaken. Cool in pan on a wire rack. Use foil to lift uncut brownies out of pan. Cut into brownies. Hi, Jenny! I haven't talked to you in so long you probably have forgotten who I am! I used to do the Halfasstic blog. Anyway, this recipe looks delicious and my younger daughter is a HUGE fan of anything pumpkin.